• The Mars Series Shell Pack offers 100% Birch, shallow depth shells with the new SONIClear(TM) bearing edge, producing a fast, clear tone with a quick rebound. 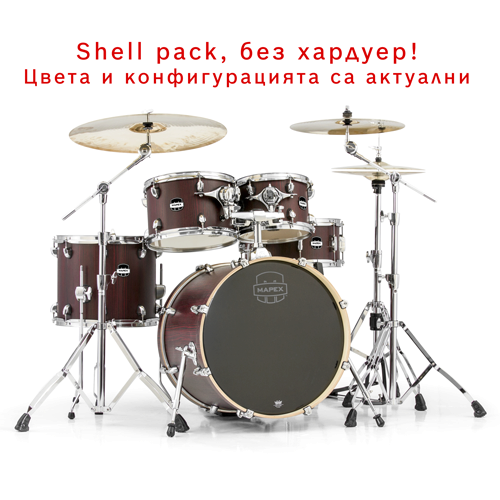 • The Mars Series “Fusion” Shell Pack includes smaller sizes that are equally suited for the rock drummer needing a highly portable, great sounding kit, or the jazz drummer needing versatility. • The Birch 6Ply 7.2mm shell, with the new SONIClear(TM) Bearing Edge, allows for the direct transmission of sound, reduces unwanted frequencies and provides a strong fundamental pitch and an effortless tuning experience especially at lower tunings. • This 5-piece shell pack includes 10" and 12" mounted toms, 14" Floot Tom, 14" Snare Drum and 20"x16" Kick. • The SONIClear(TM) tom suspension and floor tom feet increase overall resonance by preserving vibration in the shell and keeping stress away from the tension rods, helping the heads stay in tune.